It was brought to my attention this morning at an NSLS meeting that the Illinois School Library Media Association is creating a new state book award. The Bluestem Award is named for the state prairie grass of Illinois and it will be a kids' choice award for kids in grades 3rd-5th. In the spring of 2008, the ISLMA board approved establishing a committee to explore the possibility of a new book award that would fit between the Monarch and Rebecca Caudill Awards. Interested library media specialists met in June, and an outline of the proposed new award was presented to the board in August. In September, a survey about the new award was conducted, and 92% of respondents favored the creation of a new award. The ISLMA board approved the new award at their October meeting. The award is designed for students in grades 3-5 who are ready for longer titles than found on the Monarch list, but not quite ready for the sophistication of some of the Rebecca Caudill titles. 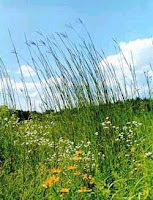 Named in honor of Big Bluestem which is the state prairie grass, the award may include both timeless classics and current titles, as well as books that have appeared on Monarch and Rebecca Caudill lists. It looks like the first Bluestem Award will be given out in 2011 and registration forms for the voting will be available in May 2010. It doesn't appear to affect the established Rebecca Caudill or Monarch awards and it looks like schools may choose to participate in more than one of the awards programs if they so desire. I'll be interested to see what makes the first nomination list (coming in 2010? ), especially since it doesn't require that books be published within the last five years like the Caudills and Monarchs.